Star set to receive millions in royalties after huge success of album. Singing sensation Susan Boyle will be able to celebrate her birthday in style this year as she becomes a multi-millionaire. The Scots star of Britain's Got Talent is set to receive £4 million on April 1 - her 49th birthday - after becoming an overnight sensation. A close friend of Susan said: "People have thought of Susan as a millionaire for months already because her album was released in November - but she hasn't got it yet. It takes time for royalties to come through. She has been told it will be there for her birthday on April 1. "Until now her management team has made sure she never wanted for anything. She has been receiving an allowance from Simon which has been more than enough to live on. "But this is her long-awaited pay day finally arriving." 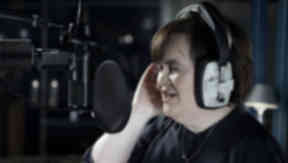 Susan Boyle's debut album,* I Dreamed a Dream*, broke British chart records, selling 3.1 million copies in its first four weeks of release. It has now sold more than 8.5 million worldwide. It is just a year since her appearance on the TV show that propelled her to fame. Next weekend, she will fly to Japan where she is due to perform to a 10,000-strong crowd on her birthday as a guest with the Yomiuri Nippon Symphony Orchestra in Tokyo.